Length: 22 to 26 in. Wingspan: 38 to 45 in. Small fish, crustaceans, aquatic insects and amphibians. 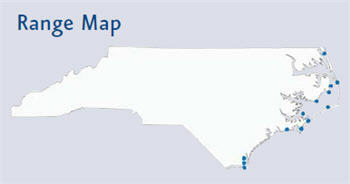 In North Carolina breeding activity begins in the early spring. Upon arrival at the breeding grounds, the birds defend a small breeding territory against other individuals and soon begin nest construction. Three to five blue-green eggs are laid in a crude stick nest, often only a few feet away from another nest. Approximately 3 weeks of incubation is required for hatching. Young snowy egrets are completely dependent upon their parents for food and protection from the elements and predators. Both parents share in these duties, and the energetic young are climbing around in the nest tree by their third week. Weather is a big factor in the survival of young snowy egrets. Periods of cold, rainy weather during the breeding season result in high chick mortality in the rookeries and often cause a second nesting attempt by unsuccessful breeding adult egrets. The snowy egret has a definite affinity for salt or brackish water and is found close to the beaches and marshes of the North American coastline. Unlike most other long-legged waders, this egret remains in its marine environment throughout the year. Other wading species tend to wander widely during the summer, and are often found hundreds of miles inland from their breeding or wintering areas. 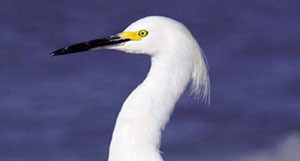 In North Carolina, the snowy egret breeds from Currituck Sound to the mouth of the Cape Fear River. It also winters in North Carolina, but in reduced numbers. The snowy egret, a widely distributed Western Hemisphere wading bird, is represented on the Atlantic and Gulf coasts of North America by the race Egretta thula thula. Seldom found far from brackish water, this egret is a fairly common breeder along the coast of North Carolina. The snowy egret has been described as the “most charming of all our marsh birds.” Whether displaying its gorgeous breeding plumage or racing about in pursuit of small fish in shallow water, it is an exquisite sight, with gleaming white plumage, jet black beak and legs, and bright yellow feet. One of the smallest wading species, the snowy egret is approximately 2 ft. long, with a wingspread measuring as much as 3 1/2 ft. The plumage is pure white throughout the year. Males and females are similar in appearance even during the nesting season. During the breeding season, snowy egrets acquire long filamentous plumes on the back, head and neck in both sexes. Birds can erect these plumes to display their feathered finery to each other during courtship and to rivals in defense of their territories. This beautiful bird species had a very close brush with extermination in North Carolina early in the 20th century. Beginning in the late 19th century, the plumes (elongated feathers) of this and other wading birds were in great demand by makers of women’s hats. Thousands of egrets and herons were shot, usually in the nesting colony, and stripped of their delicate feathers with the bodies discarded where they fell. Because the birds were slaughtered during the breeding season, the impact was exaggerated, resulting in the loss of breeding adults and the dependent young that died from starvation. During the summer of 1898 ornithologist T. Gilbert Pearson was unable to locate breeding snowy egrets anywhere on the coast of North Carolina! Intensive educational efforts of Pearson and the National Association of Audubon Societies brought the devastation to the attention of the American public. Later, in 1904, Pearson noted the presence of eight breeding pairs of snowy egrets in southeastern North Carolina at Orton Plantation, near Wilmington. In 1917, he located approximately 30 pairs of snowies in a large heron colony in Carteret County, N.C. The safety of these birds was assured when a warden was hired to protect them from plume hunters. 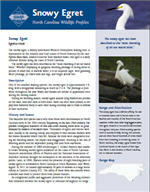 Snowy egrets are found in wetlands along the coast of North Carolina and occasionally inland. They nest in colonies or groups on barrier and estuarine islands. 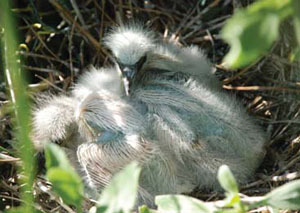 These birds appear to prefer nesting on small islands in the sounds, which are generally isolated, and provide protection from mammalian predators such as raccoons. Platform stick nests are built by both sexes and are placed in trees, shrubs and sometimes on or near the ground in marshes. Most colonies contain several species of wading birds, often with hundreds of them congregating in raucous communities of less than an acre. Snowy egrets feed in wetland habitats such as tide pools and shallow bays where they eat fish and other aquatic organisms. These carnivores employ some interesting techniques to catch their prey. They are very active foragers, often running or walking in shallow water in pursuit of fish. They will also try to flush prey from hiding spots by using their yellow feet to stir or paddle the water. These actions may either attract or scare fish into motion at which point the egret can strike with its specially adapted, long bill. The snowy egret is a treasured icon of the coast. Although this egret survived the feather trade, it still faces a variety of conservation threats. For example, wetland loss due to development leads to a loss of habitat. This species is also sensitive to human disturbance at breeding colonies and to environmental contaminants such as pesticides and oil. It is important to note that because of their position in the food chain, snowy egrets and other wading birds are considered excellent biological indicators of the health of our wetland ecosystems. NCWRC and partnering organizations conduct coast-wide surveys for snowy egrets and other waterbirds every couple of years in an effort to monitor population trends and nesting locations. Biologists also post state-owned nesting sites during the breeding season to protect nesting birds from human disturbance. Many of these sites are on man-made dredge-material islands in the sounds. You can help snowy egrets and other nesting birds by respecting signs and staying off of posted areas. This simple act can go a long way toward ensuring birds have a successful breeding season. In addition, please dispose of garbage properly. Discarded fishing line and nets entangle and kill snowy egrets and coastal birds. These birds are a symbol of wild and healthy wetland ecosystems and with a little help, they will be around for future generations to enjoy. “snowy egret” in the search bar. Bent, Arthur Cleveland “Snowy Egret,” in Life Histories of North American Marsh Birds, (Dover Publications, 1963), pp. 146-156. Parsons, K. C., and T. L. Master. 2000. Snowy Egret (Egretta thula). In The Birds of North America, No. 489 (A. Poole and F. Gill, Eds.). The Birds of North America, Inc., Philadelphia, Pa.
Potter, Eloise, James F. Parnell and Robert Teulings Birds of the Carolinas (University of North Carolina Press, 1980). Terres, John K. The Audubon Society Encyclopedia of North American Birds (Alfred A. Knopf, 1980). 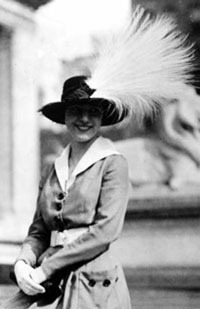 [Woman with feather plume hat]. Photograph. [date unknown]. National Wildlife Refuge Assocation. http://nationalwildliferefugeassociation.com/birding/conservation1.html (accessed April 16, 2015). Photos by North Carolina Wildlife Resources Commission and Rodney Wiley, Florida State Parks. Eggs and chicks by Alex Houston.